One day before iOS 7 will become available to download, Apple has revamped the iCloud Web portal to reflect user interface changes seen in the company's mobile platform. Previously in beta testing, the update brings congruity to the two UIs, offering users a seamless experience when moving from one to the other. Most apparent is a dynamic background borrowed from iOS 7 that shows a pastel blue gradient with constantly moving blurred orbs. Other features introduced include app icons that match iOS 7 counterparts, including Mail, Contacts, Calendar, Notes, Reminders and Find My iPhone. 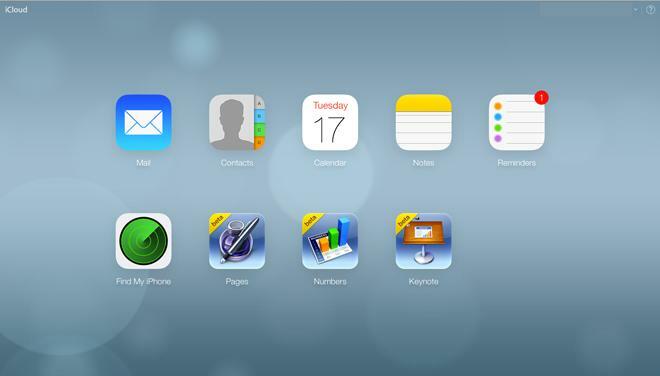 Icons for beta versions of Pages, Keynote and Numbers are carried over from iOS 6. It appears that Apple has rolled out the updated website to all users.